The mysterious Longdendale Lights and other legends of Derbyshire’s Peak District will feature in a new BBC series marking the 50th anniversary of The Pennine Way. 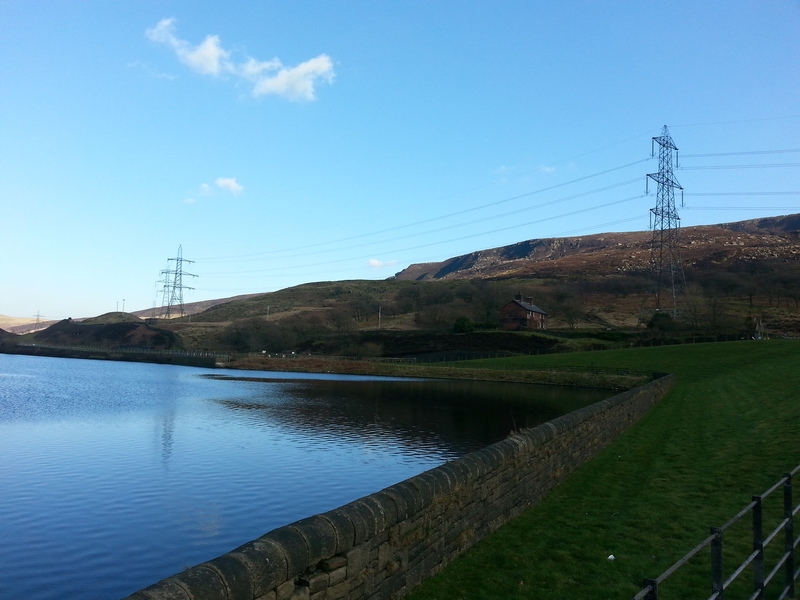 Torside Reservoir looking towards Bramah Edge and Torside Clough, home of the mysterious ‘Longdendale Lights’ of Derbyshire’s High Peak. First opened in 1965, the 268-mile trail stretches from Edale in the High Peak to Kirk Yetholm on the Scottish Border, taking in some of Britain’s most rugged and spectacular countryside along the way. In this four part series polar explorer and ocean diver Paul Rose takes on a challenge closer to home, presenting a fascinating history, geography and flora and fauna of this diverse trek across the backbone of England. In the first episode Paul finds out how the route has changed in the past half century and owes its existence to the right to roam movement led by northern working class folk during the 1930s. I was interviewed by Paul on the path descending from Torside Clough on Bleaklow to discuss the legends of the Peak including the phantom lights that haunt the upper Longdendale Valley. I first heard about these ‘spooklights‘ during my time as journalist for the Sheffield Star. When talking to members of Glossop Mountain Rescue Team I was amazed to find they kept a log of calls from people reporting bright red lights hovering over the moors late at night. Fearing walkers were lost on the heights of Bleaklow, the teams had turned out again and again only to find no trace of anyone in distress. My inquiries turned up dozens of similar accounts of mysterious moving lights, sometimes in a string and others taking the form of a beam and even a bright white light that filled the entire valley. One informant said the lights had been seen for decades, long before the arrival of cars, electricity pylons and aircraft. They were pointed out by his grandmother who called them ‘the Devil’s Bonfires’. Mention of the diabolic origin of the lights is certainly consistent with other persistent supernatural legends from Longdendale and the High Peak. These tells of chilling presences, dark figures and uncanny visions in the upper valley. Some of the stories attribute the lights to lamps carried by phantom Roman legionnaires who tramp the course of the Roman road from Brough in the Hope Valley to Melandra near Glossop. They are spotted occasionally by walkers and I was told by a Peak Park Ranger that on one occasion one witness had to be treated in hospital after his experience on the moors. You can read more about my investigations in the haunted valley of Longdendale from my 1999 book Supernatural Peak District here. The first episode of The Pennine Way will be shown on BBC1 North at 7.30pm on Friday, 10 April 2015 and will be followed by a network premiere on BBC2. This entry was posted in Uncategorized and tagged BBC 1 North, Bleaklow, Derbyshire, Devil's Bonfires, Edale, Glossop, Glossop Mountain Rescue Team, Longdendale Lights, Longdendale Valley, Paul Rose, Peak District, Sheffield Star, spooklights, The Pennine Way, Torside Clough. Bookmark the permalink.